It is now the end of April. The vegetable garden is coming along nicely, and there are actual flowers in the flowerbeds. 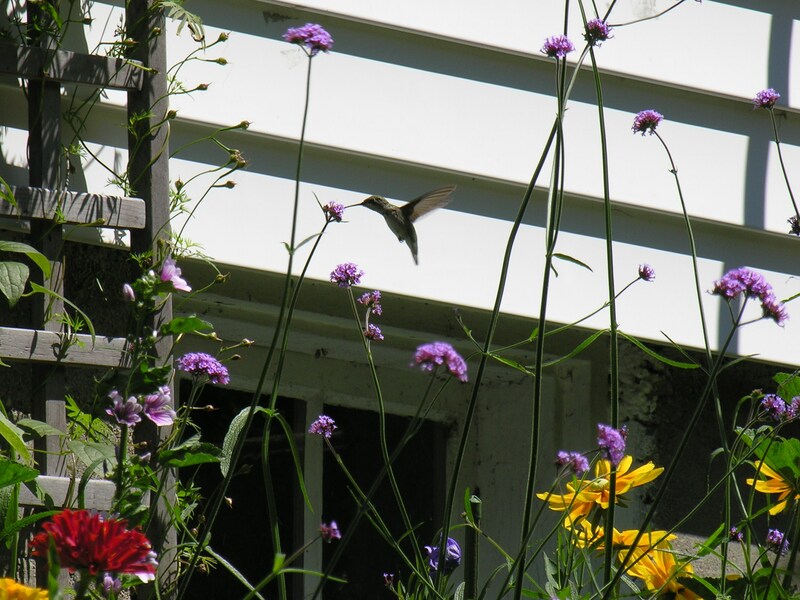 But for me, the garden is never complete without hummingbirds. It took me a couple of years to attract them to my former house and we had a healthy population. We moved last fall, and now I wonder whether I will have them here. After all, we are only a few houses away from the old place. My feeders are up – in the front and the back – and I am keeping them scrupulously clean. Other people in my area are reporting their first sightings. Here in the northeast, we have historically had only Ruby- throated hummingbirds. Although, for the past few years, perhaps due to climate change, that has not been entirely true. 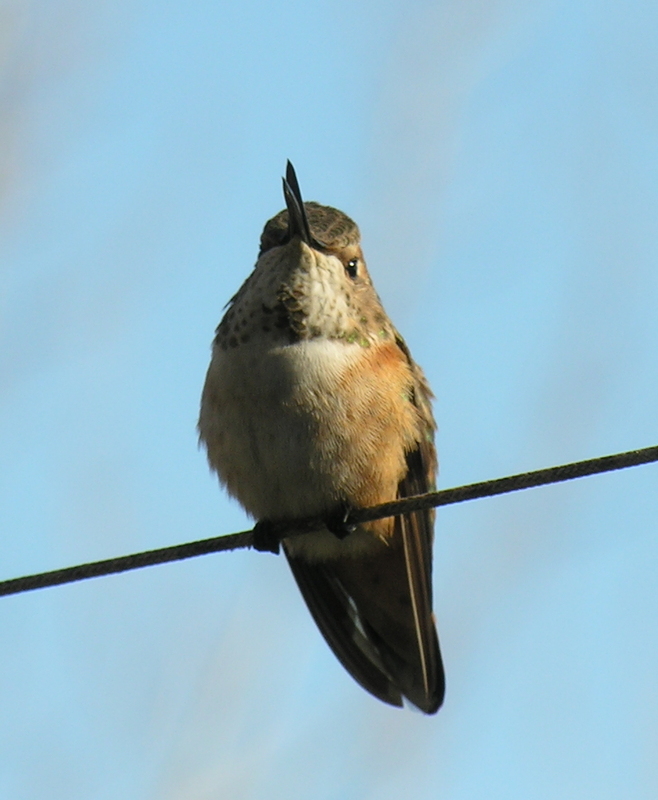 Here’s a photo that I took of a rufous hummingbird – usually found in the west – in NOVEMBER at my neighbor’s house a couple of years ago. That bird didn’t make it, and presumably (because they just disappear) nor have the other so-called “vagrants” that have found their way here, so far out of their usual range. A juvenile rufous - in Rhode Island! I like to track the Ruby- throateds’ spring migration, so I know when to hang my feeders. There’s a great migration map here, and in New England, we are fortunate to have a website called “New England Hummers” in which people report their first and last sightings. It’s also the best source for hummingbird news in our region, including reports on fall vagrants. A common misconception about hummingbirds is that they live on nectar. They are actually primarily insect-eaters, so leave those spiders and bugs alone! Finally, please don’t add red food coloring to the solution in your hummingbird feeders. It is not necessary to attract the birds, (the red on the feeder is sufficient) and many researchers believe that the dye is bad for them. I’ll let you know when my first hummer arrives. For now, I’m still waiting…..
great photos, dn! i just put my feeder up yesterday. it feels late, probably because of the great warm weather we’re having here, but this is the usual week they show up every year. Hey thanks, AB! I keep a garden/birds journal, and like yours, mine usually arrive with the Baltimore orioles during the last week of April. The source of my angst is knowing they’ll arrive at our old house and there will be nothing for them there. I am assuming that being the smart little birds they are, (and having to eat every few minutes!) they won’t wait long at the old place, and will go off in search of other sources. That’s when I hope they’ll show up here. Mine have arrived in Charlestown…at least the males have. They seem to do the scouting and then the females appear. I’ve also heard the orioles calls, and have the feeder out, but they haven’t visited yet. Jealous! The males always arrive first. Take good care of yours and send good vibes to mine. The first picture is fantastic. No, no hummers here yet – at least none that I have seen. The orioles arrived overnight though, and were singing this morning.